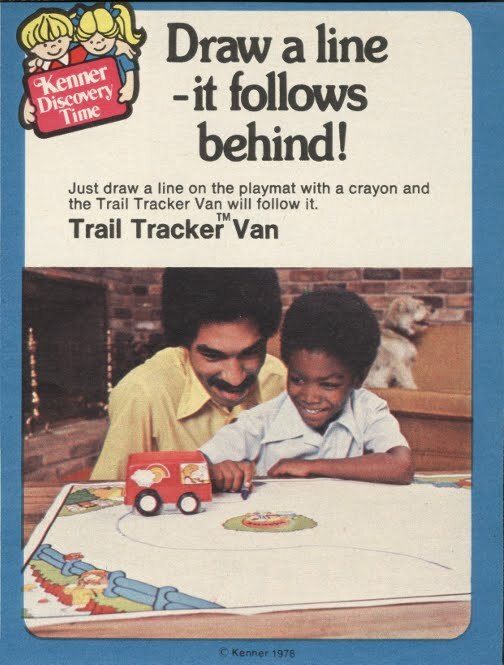 So if I can gather it correctly from the ad, Kenner Trail Tracker was a little toy van that would follow a crayon line. And ... that's about it. I am not sure if I am not imaginative enough to understand how this could translate into hours of creative play or if it's just a not that great toy. Says one person in the Rifftrax forums: "It works on the power of cheesy music." Sorry, this one draws a blank. In 1978 I was too old for toys like this. I agree with your assessment, though it might have been better targeted at very small children, or better thought out for a more interesting and educational toy. Yep, I totally had one it and was pretty entertaining for because I was only five at the time. Got bored with it eventually but my cousin, who was one year younger than me LOVED it so I have it to her. I remember toys like this in both the late 70s and early 80s and they did work. I loved them. What you did was, you would make a city out of your Girder & Panel sets or out of cardboard & Styrofoam (cut up and shaped and painted cereal boxes, shoe boxes, packing materials, etc) and you would have a few of these cars for the traffic in the city. Then your action figures would do battle in the city or have chases in their vehicles while avoiding these cars or trying to capture one that had the bad guy on top (you can even add turrets, missiles on them). We also would make huge race tracks and have a few of these going around them with stands and bridges (or "jumps" where they fell off the side and picked up the line at the bottom. You could paint and detail these cars too. I wish they still made them for our own kids. Or better yet a more powerful version that could handle proper ramps and jumps or just be faster. Classic Clip Monday: Bradys or Partridges?